Skill and compassion go hand in hand when Dr. Katz is providing exceptional patient care. As a dental professional, Dr. Katz stays up to date on the latest advancements in dentistry in order to provide the most current treatment options for his patients. Skill and compassion go hand in hand when providing exceptional patient care. As a doctor, Dr. Katz recognizes that his patients are unique individuals who have placed a great deal of trust in him and his team. Dr. Stuart Katz graduated from University of Pennsylvania School of Dental Medicine. He then completed a one year internship in General Anesthesia at Medical College of Pennsylvania, before starting his residency in Oral and Maxillofacial Surgery at Montefiore Medical Center, Albert Einstein College of Medicine and Jacobi Hospital, in New York City. His training included all aspects of the specialty including TMJ, implants, trauma, orthognathic, pathology, and dento-alveolar. Dr. Katz has been treating patients for twenty seven years. He now practices the full scope of Oral and Maxillofacial Surgery, with emphasis on implants, wisdom tooth extractions, dentoalveolar surgery, biopsies, sleep apnea and the conservative and surgical treatment of TMJ Disorders. 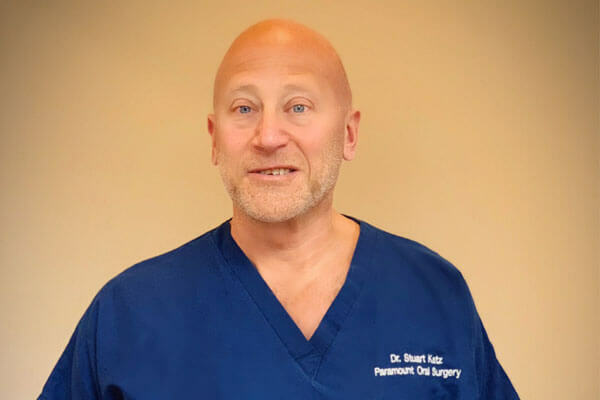 In his spare time, Dr. Katz enjoys spending time at the gym working out, driving to Long Beach Island and taking in the beach scenery. He also enjoys playing golf.